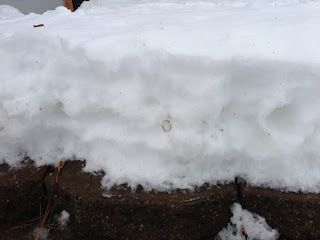 The night before we left for Las Vegas, Joe went to brush some snow off his pants as we were in front of our house and he felt his wedding ring come off. 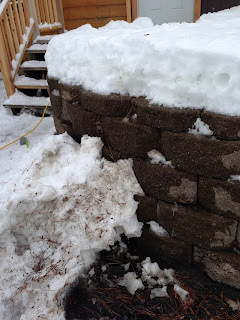 We were babysitting for Adley and Finn Spoelstra at the time so we didn't have a lot of extra time to look for it at the moment, and it was certainly not visible. I don't know if you have ever lost something small and metal in snow before, but it is AMAZING how it can just disappear! That night, we spent a good hour sifting through snow and melting pot after pot on the stove. No luck. 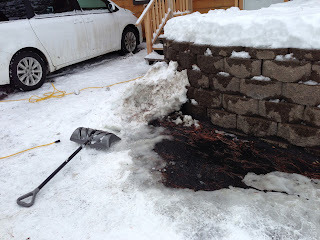 Joe knew he had to find it before we got more snow and the snow plow pushed everything away never to be found again. He got a blow torch thing from the maintenance shed and went back at it. After a good while, I heard it come inside and could almost sense his excitement. 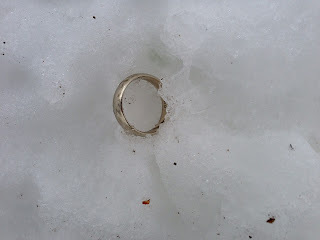 The ring was found! It had fallen on top of the retaining wall instead of on the ground and the heat from the torch made it visible. I wish I had a before picture to show you the large mound of snow that began in this location...but here is photos right after he found it. Just had to look up!